32 personalities currently on file. Unusual Features: Baronian's like many elder races have denser tissue than is typical for a human. Baronians have roughly double the tissue density of a normal human. As a result, Baronian strength and resistance to injury is commensurately higher. Baronian physiology is geared for battle and their endurance, reaction time, healing rate, and other combat factors are all significantly enhanced. 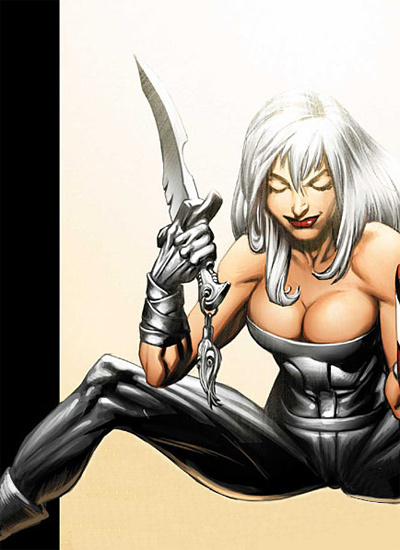 After being set free from enslavement, Senalloy was allowed to regain the full measure of her strength and powers which easily exceeded Rakaar's both in combat and magic. This of course being the reason she was kept weakened and enslaved in the first place. Magical Skills: The full extent of Senalloy's magical abilities is still as yet unknown, but she is capable of recognizing and casting the highest orders of spells. She is adept at fast-casting and can even fast-cast spells of the 5th magnitude which is typically only possible by the most powerful elders. Given these observations, she, at the very least is equal to a grand-loremage. Tournament Rank: Senalloy does not yet attend tournaments (but she intents to in the future). The Baronian war-witch is at the very least an elder, with extensive combat experience. She has sparred with 14th circle masters and defeats them easily. This makes her an unlimited class competitor. She has sparred competitively with Dulcere Starbinder, a command rank Kriar with significant battle experience, and was able to keep up with her. This means that she fights in the "untouchable" class of elder elites such as Loric Felspar and Aarlen Frielos. Information: Senalloy's origin and histories remain largely a mystery. As revealed in Shaladen Chronicles: A Knot In Time she is no less than five millenniums old (this is the length of time she was a slave to Rakaar). Though the actual events that led her to come into Rakaar's custody have not been revealed, it is speculated that she was given to him as a punishment. When Dulcere, and later Corim, meet Senalloy, she is horribly scarred and disfigured as a result of torture. This she explains was punishment for attempting to escape. Senalloy never alludes to Rakaar having done it, so one can only assume this punishment was received at an earlier date and merely maintained by the cruel and indifferent battle-mage. At some point prior to her involvement with Rakaar, Senalloy came in contact with a Kriar engineer on Karanganoi homeworld. It is from this Kriar that Senalloy learns the Kriar language and attains her formidable understanding of Kriar artifices. Senalloy has demonstrated the ability to pilot shuttle, freighter, and fighter class Kriar starcraft. She has a strong working knowledge of cyber systems and self-willed mecha. She is even capable of minor repairs on these various devices. According to Senalloy, she helped organize a Karanganoi resistance, and helped key Kriar personnel find refuge amongst the various resistance cells on Karanganoi homeworld. Presumably, it is these acts for which Senalloy is punished and enslaved. After being freed from Rakaar by Corim, the powerful Baronian lady becomes infatuated with the young man. Her relationship with him is half teasing/half serious. The fact that Corim only has eyes for Dulcere Starbinder has kept Senalloy from making much progress. Given events that have so far transpired, Senalloy could easily win Corim too her, as the (comparatively) young man is already fond of her. So far, it has only been her debt to Dulcere that has kept her from interfering further in the relationship between the Kriar belkirin and new Shael Dal candidate. Unusual Features: Elsbeth is constantly under the influence of magics which manipulate the light around her. No matter what the visual conditions are, the illumination always reveals her in the "best light". Elsbeth's red hair shimmers and changes under brightly lit conditions the hue darkening or lightening with her mood. Elsbeth's mastery of magic enables her to change her shape at any time. Though she has had the Shaladen Starwind within her possession for many years, the permanent effects caused the augmenting energies within the weapon have not affected her. So, unlike other the other members of the Shael Dal, she does not have increased density. Known Relatives: Too numerous to list. All of Elsbeth's immediate children are no longer alive. However more than 40 generations of sucessors live on. Descendents of her blood number in millions. Magical Skills: Elsbeth is an elder elite with magical skills far in excess of a grand lore-mage. Her magic is unquestionably among the strongest in all of the Ring Realms. Only the Eternals, Jyril, and a handful of elders and ancients have skills any more sophisticated. Elsbeth's specialty is mind control (charms), but she has also developed an extremely complete arsenal of magic specifically designed for destroying technology and/or hindering its operation. Tournament Rank: Elsbeth does not engage in physical combat, and its been millenniums since it was necessary. Under duress, she trains with the rest of Shael Dal-- she recently started a tutelage with Beia Targallae after having been thrashed by another elder who was immune to magic. She is in training to get a rematch. Currently she would be considered to have 4th Rank combat skills. In terms of battle capabilities, there are few creatures in the Realms that can withstand even one of her battle spells. skills are quite a bit less refined. age is difficult to pin-point, but it is surmised she is about four to five millennia younger than Aarlen hence the difference in their powers and abilities. Unusual Features: Like the other members of the Protectorate Algernon's body is denser than a normal human's. Wielding the Shaladen Warstar and as the Avatar of the Eternal Garn, Algernon can increase his mass and strength to far greater levels than any of the other members. He can raise his strength to the point that he can easily lift over ten tons, and can deform high grade steel with his hands. Group Affiliations: The Protectorate, The Band of the Crescent Moon, The Falorian Warrior's Academy, House Felspar, The Barony of Eastern Ivaneth, House Tradeholme, The House of Ivaneth Lords. Magical Skills: Algernon possesses some minor wilderness related magic that is a product of his training as a ranger. Tournament Rank: Algernon does not regularly participate in tournament play. He does however participate in the Frielos-held "Hunter's Game" which is a combination of combat, stealth, and strategy. Algernon has extensive combat experience, and has been a part of several war campaigns and adventures. Even without the enhancements of his Shaladen blade he is a 14th rank warrior. Information: Algernon is a second generation member of the Band of the Crescent Moon. He is one of the Band who elected to remain involved in Ivaneth affairs. He currently holds the titles of Lord and Baron, and is the active guardian of the Ivaneth's Northeastern border. Algernon and Talorin Falor are drinking buddies and team members for the Shael Dal. They play together quite successfully for the Frielos Hunt. Group Affiliations: The Jhandris'Kul Myrmigyne Clan, The house of Idun, the Brethren Guild of Ivaneth. Magical Skills: Irodee possesses no magical skills per se. She however has the bard's talent for reading magical scrolls. She also knows the Nethra granted weapons charms that are taught to blooded warriors who particularly distinguish themselves in battle and deed. Tournament Rank: As a Myrmigyne of the clans Irodee participates in tournament style combat on a regular basis. Her experience as a tournament warrior biases her 12th rank standing. Bias aside, she is a formidable warrior, and a devastating opponent not at all disadvantaged by her size. Information: Myrmigyne of Jhandris'Kul clan, follower of Nethra, and wife of Laramis De'Falcone. Her maiden name is Irodee Ki'Targallae. In Myrmigyne, the Ki suffix before the proper name means adopted sister. Irodee is a long time friend of Wren Kergatha. Irodee is the biggest woman ever born among the clans, measuring just a hair under 22 hands tall and weighing almost 17 stone she is nothing short of imposing. Irodee's natural mother died when the girl was still young, thus she spent a most of her youth in the care of various foster mothers. Gawky and clumsy because of her quick growth, she found growing up in the clans difficult first because of her inability to compete with her sisters then later because of her size. Ess Targallae, the sister of Myrmigyne Queen, adopted Irodee when she was early into her teens after the girl proved her bravery and commitment to the clan. 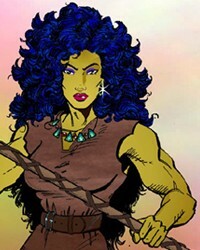 As the prot&eacute;g&eacute; of the Queen's sister, Irodee learned quickly and developed into a skilled warrior. In addition to being one of foremost warriors in the clan, Ess Targallae is one of the best educated. She tutored Irodee and eventually sent the girl to the best schools in Malan and Ivaneth. It was while in the schools that Irodee truly flourished. She became a favorite amongst the teachers, a gentle giant with a caring disposition and a thirst for knowledge. She graduated with honors from two universities, and holds advanced certificates in language and history. She speaks six languages fluently: Myrmigyne, common, sea trade, both the Elf High Tongue and Dikeeni, and Dwarven. While she is highly intelligent, Irodee is somewhat uncomfortable in letting it show. She prefers instead to play "dumb" and often speaks in broken fragments like a barbarian. After marrying Laramis she confused many of her friends in the way she only showed her mastery of language to her husband. When not in his presence she lapses back to her fragmented speech patterns. Shortly after the birth of their daughter, Irodee accepted the ki'succorund (voluntary avatarism) for Ukko.